Musicians: Jim Gordon (drums), Chuck Domanico (bass), Louis Shelton (guitar), Larry Carlton (guitar), Milt Holland (percussion), Pete Jolly (accordion on “How Can I Tell You”), Tim Weisberg (electric flute on “Ocean Song”), and Clarence McDonald (keyboards). 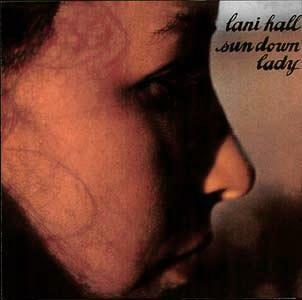 With only her track record as lead vocalist for Sergio Mendes to go on, Lani Hall and Herb Alpert took to the studios in 1971-72 to produce the album SUN DOWN LADY. The album gathered a who’s who of studio musicians to lay down some fairly familiar songs that would now have Lani’s imprint on them. Herb and Lani wrote new lyrics to “Muskrat Love” changing the song into the album’s outstanding “Sun Down,” with Lani herself penning the song “You.” Other lyric changes occurred on Paul Simon’s “For Emily, Wherever I May Find Her” modifying its gender references. Another item of note here is a trademark Alpert arrangement of Elton John’s “Tiny Dancer”, taking what is usually a ballad and speeding up the tempo, giving the song an entirely different feel. Michel Colombier’s “We Could Be Flying” from the WINGS album appears here in a stripped-down mix, removing the huge orchestral accompaniment, and with the release of this album got some radio airplay.